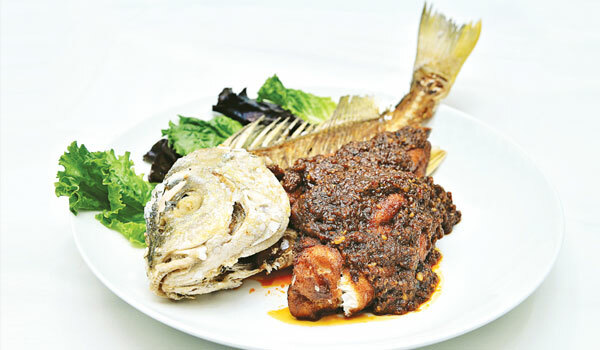 The Leela Palace presents a four-course menu in its first seafood festival at China XO. OPULENCE gets a new meaning at The Leela Palacea��s specialty restaurant, China XO. As though to reflect the deep blue, amber, coral reds and golds of the dA�cor, the night sky is spread out like a Chinese emperora��s robe. Silver tipped waves crash against the Bay. The August moon is a ripe melon sliced in half. a�?Wea��ve called it Seafood by the Bay,a�? explains Dharmen Makawana, the Executive Chef at the Leela, as he introduces Chee Soon Hoong, a young Malay-Chinese chef who is from Ipoh. Gopi Chopra, the regular China XO chef, stands by his side. Between them, the three chefs have cast their nets into the ocean and drawn in an exotic variety of seafood. Each dish is presented as delicately as a brush and ink painting by a Chinese calligraphist. Tiny morsels of crab and lobster have been artfully steamed in a variety of dim sums, laced with truffle oil, or the scent of morels. They are served with an array of robust sauces taken from a Singapore-Malay-Japanese repertoire so that they burst upon the tongue like a firework display. Chef Makawana for instance favours the curry-like smoothness of laksa paste, that combines the best of South Asian flavours from dried chilies and prawn, galangal, lemon grass, ginger and turmeric. It gives a whole new colour to the steamed crab and prawn dumplings. Crispy fried enoki mushrooms appear like versions of the cartoon character Dilbert on the plate. They come wrapped in green sheets of Japanese sea-weed or nori, flash fried, the mushroom waving like curly strands of hair at the top and served with a sweet chili sauce. Not to be outdone, the next item on the dim sum parade is even more exotic. Chilean sea bass has been rolled in delicate nets of Egyptian kunafa pastry that we eat dipped in a Japanese wasabi mayonnaise. We did not think of air miles when eating the Chilean sea bass, but remember another Chinese delicacy called The Dragona��s Beard, that we once sampled in Hong Kong. A Flower Crab filled with a fine broth of barely-steamed egg white follows. We soothe our palate with a hearty crab soup and prepare ourselves for platters of whole lobster; a white snapper, the catch of the day, is still looking surprised at landing on a plate. We end the meal with Singapore-style noodles.